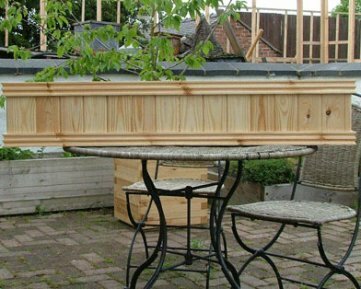 The Connaught Wooden Window Box is perfect for any window ledge, wall or fence. The design is elegant and has decorative top and base finishers. It is a beautiful way to display your plants and flowers whilst looking good in its own right. 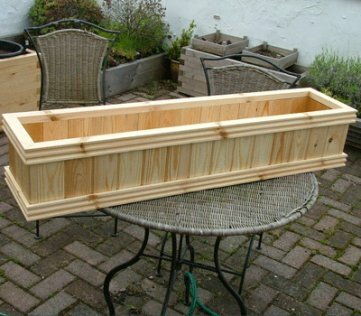 Connaught windowboxes are made from Scandinavian red pine with holes in the base for good drainage. The windowboxes can be finished in clear, golden brown, wild sage or white preservative. We also offer a selection of Farrow & Ball paint finishes. Without even an inch of ground to their name, anyone can put on a really good show with window boxes alone. Even in the confined space of a window box it is possible to create a variety of styles. A limited palette of one colour plus foliage plants - for example, a rich red geranium with ivy - would provide a vibrant, yet formal style. Silver and grey is a deservedly popular colour combination for foliage in window boxes. Add a white or cream variegated ivy or white-flowered lobelia to add highlights to a cool contemporary display. For a north facing window use ivy, box or busy lizzies, which all thrive in shade, as well as ferns and cyclamen. In full sun try floriferous diascias in a range of pastel colours. be deployed in quite shady situations. It is not uncommon in large cities, were the warmth of buildings raises the outside temperature considerably, to use quite tender plants in window boxes. For watering a window box, it may be convenient to erect overhead tubing into which are inserted spray jets positioned directly over the window. Water can then be turned on at the household tap; with this remote control technique, always make sure that sufficient time has elapsed to allow plenty of water through, so that the window box receives a thorough soaking. Another, similar method is to have very fine 'drip tubing' leading from the main tube and going straight into the window box.